1st row: Lorraine Merkley, Vivian White, Dorothy Ladison, Harriet Sibley, Belva Denton, Helen Barry. 2nd row: Patricia Backus, Gladys Colton, Nadine LaFountain, Harriette Ray, Mary Barrigat. 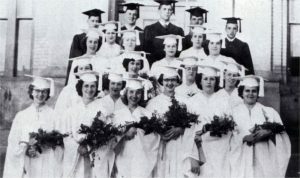 3rd row: Mildred Howland, Shirley Hewlett, Macile Howland, Jean Mills, Hope Caswell. 4th row: James Francis Dean, Etta Chambers, Merton Coloton, Patrick Ashley, Daniel Coffey, Merton Matthews.